FitEmirates services offer's top of the quality servicing of your fitness equipment, Treadmill, Exercise Cycle, Elliptical, Rowing Machine, Multi Gym, Recumbent Bike, Uprigth Bike, Pool Tables and many more. You Name it We Repair It! An Exclusive team of highly experienced technical engineers offer's a complete range of solution in rectifying the error's in your equipment and ful fill your requirement in UAE. We Service, Repair & Maintaine all the brands in the fitness sector. We provide full-service solutions to well-known Manufacturers and Retailers around the globe like NordicTrack, ProForm, Matrix, Adidas, Reebok Fitness, Kettler, Spirit Fitness, Concept2, Bowflex, Weider, Impulse, Strength Master, York Fitness, BH Fitness, Nautilus, Sole Fitness And Many More. You Name It We Repair It! We Provide top of the quality servicing solutions, repair and maintanence from our exclusive team of techinical engineers. Keep you fitness equipment fit and healthy. FitEmirates Services Annual Maintenance Program is the most comprehensive maintenance program in the industry. It is designed to keep your equipment working safely and efficiently and to reduce the frequency of repairs through regular maintenance. From the time you purchase your equipment, it is necessary to have a service agreement for maintenance even though it is under a manufacturer’s warranty. It is the same as purchasing a new vehicle and having to pay for oil changes even though the car is under warranty. All equipment has a manufacturer suggested Preventative Maintenance Schedule that should be performed from the day you receive your equipment. 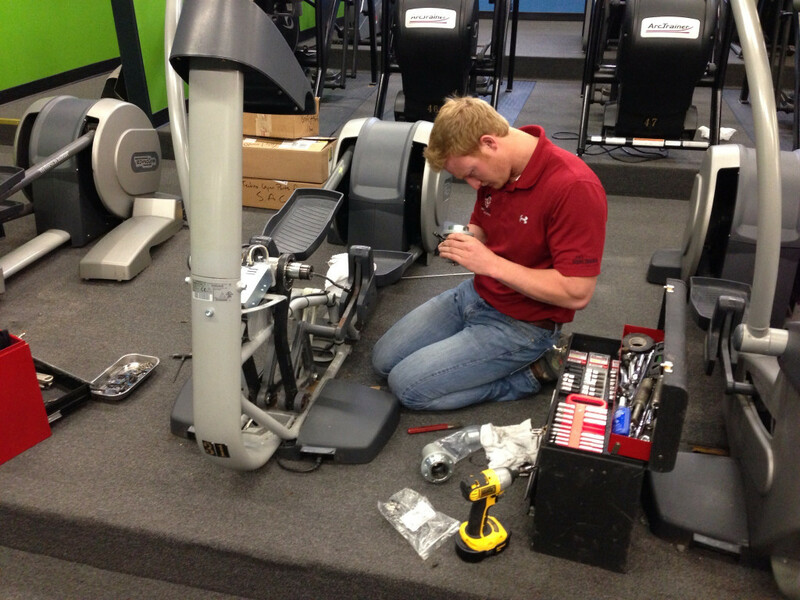 Gym Equipment Services offers a customized maintenance program designed for your specific needs. Upon approval of a maintenance agreement, your facility and all the equipment will be entered into our database to track your inventory and service history. How Will It Benefit My Facility? You will find that regular servicing of your equipment pays for itself! Lower repir cost on older equipment. Equipment lifespan if greatly increased. During each annual maintenance visit, ALL equipment covered under the agreement will have its exterior and interior thoroughly cleaned, inspected for safety, lubricated and adjusted according to manufacturer’s specifications. Upon the completion of our visit we will complete a Preventative Maintenance Checklist that will indicate any need for repairs that were discovered to avoid any down time in your facility. Take off covers, clean and vacuum out interiors. Take off dirt and debris from motors, vents and circuit boards. Examine wire harness and connections. Clean all chains, bearings, bushings, rollers, pulleys and pivots. Examine the condition of alternators (where applicable). Examine the condition and align of all drive belts, chains and cables. Align and tighten walking belt. Examine the condition of all bearings and bushings. Examine the condition of motor commutator and brushes (clean motor commutator where applicable). Examine all other parts for wear and tear. Diagnose elevation sensors and take corrective measures wherever necessary. Examine machine function and operation. Perform amp/friction tests to test wear on belts and decks. Finish audible inspection of motor, crank and roller bearings. We at FitEmirates Services offers one of its kind servicing and repair of your treadmill, exercise cycle, elliptical, multi gym, rowing machine ETC. Highly trained and experienced technical teams provides the best solutions for the fitness and repair of your equipment. Keeping in mind the requirement of the customer and offers the best solution. We undertake all type of servicing, repair of gym equipment and fitness equipment in UAE. One of the leading fitness equipment and Gym equipment suppliers in UAE with an exclusive team of servicing, maintenance and repair of fitness and cardio equipment. Once a week clean the side rails and any part of the walking/running surface or deck that is visible using a damp cloth. Dirt and dust love to cling to your treadmill deck and walking belt. Make sure to run your treadmill once every month without anyone on it. Ensure that the running belt is centrally aligned. If not, it should be adjusted. (Refer to your owners manual for belt alignment/adjustment instructions). 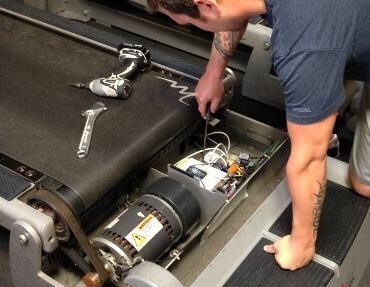 Once every month run the treadmill at full speed to clean out any dust or dirt that has gathered. Ensure that there is sufficient amount of lubrication present under the walking belt and on the deck once every month. Every six months remove the motor hood and vacuum the motor area. Dirt and dust can accumulate on the motor's and electronic components which can be a cause for short circuit. Be careful and alert to switch off the main while doing this procedure. Using a damp cloth wipe down the ramps once every week. Thoroughly examine the wheels to ensure that no foreign objects are placed in them. Check all the bolts are tight and check your machine is in level. Verify all pulleys to ensure the cables are fixed properly on them. Check all cables to make sure the coating is present and that none of them is unravelled. If you find one, replace it immediately.